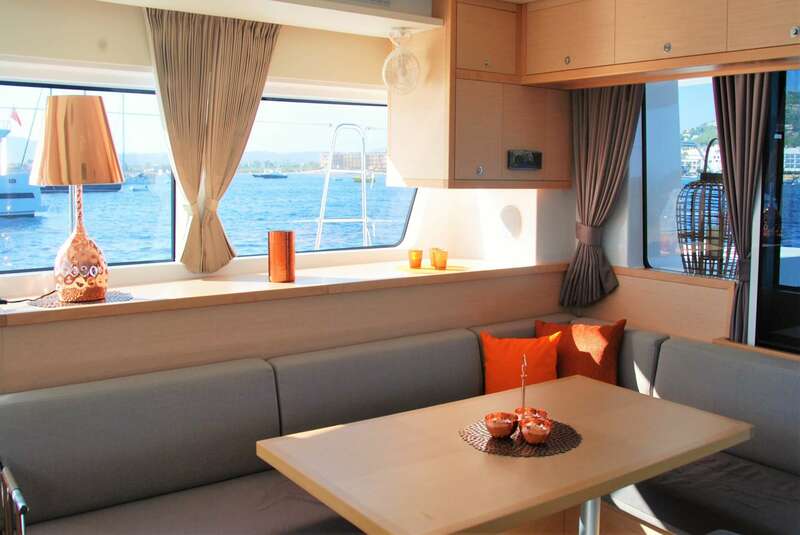 Beautiful new Crewed Charter Yacht Lagoon 52 SHANGRI LA offers luxurious accommodations and world class service. 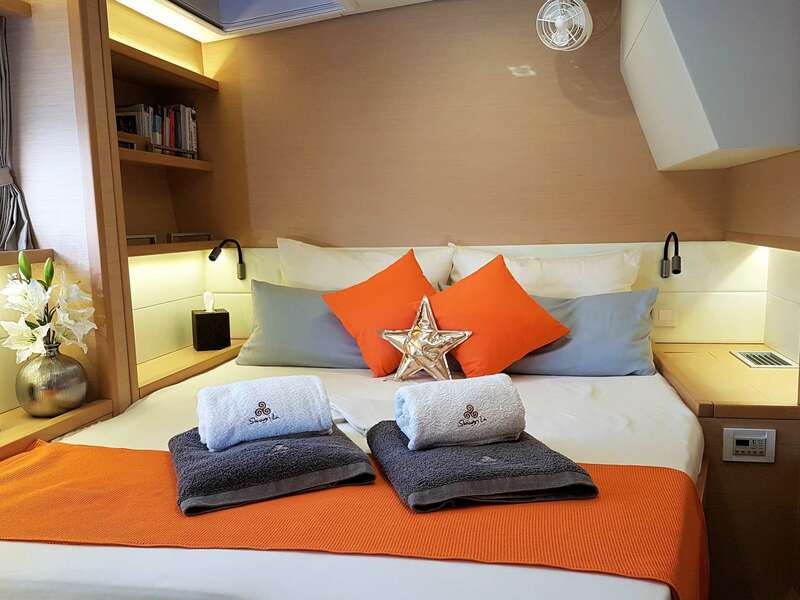 Her accommodations include 1 master cabin with queen cabin, private en-suite bath (electric head, wash basin and large stall shower), lots of storage and separate access directly to the aft desk. 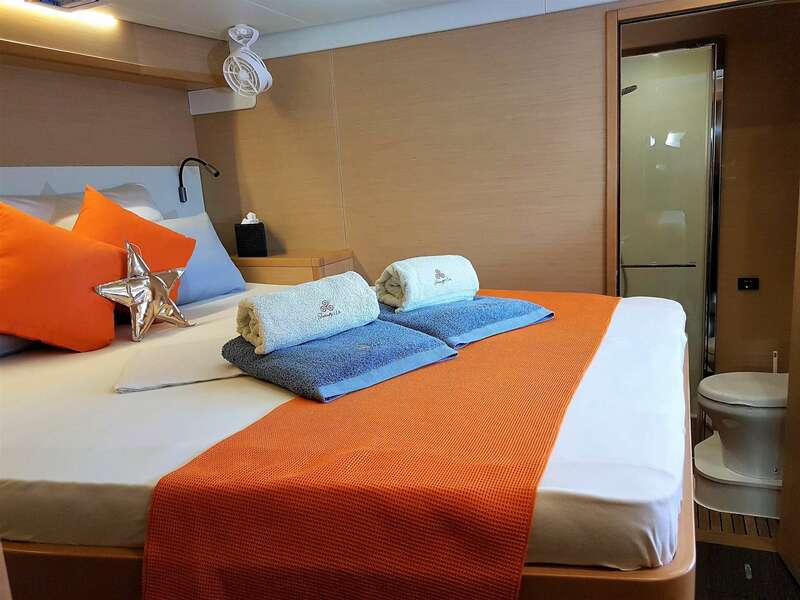 There are 2 large queen cabins each with private en-suite bath (electric head, wash basic and stall shower) plus 1 cabin with two single bunk beds. 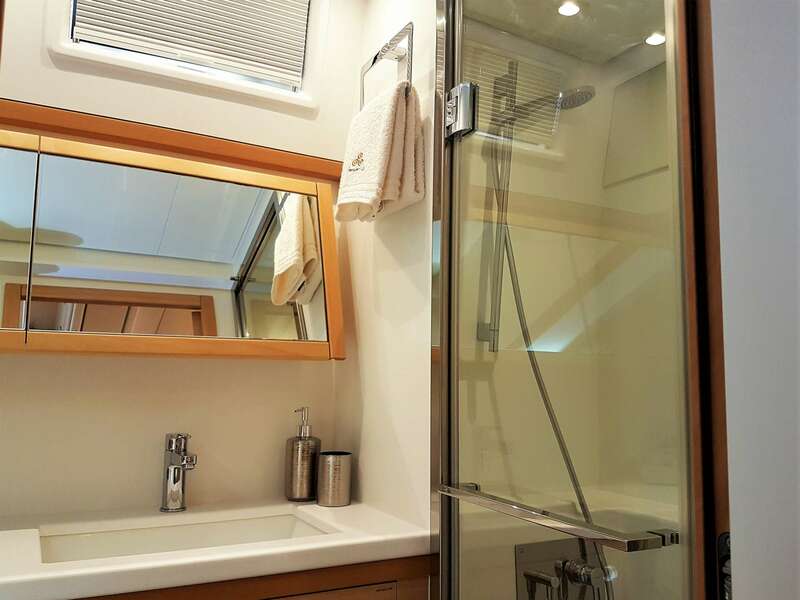 This also has a private en-suite bath (electric head, wash basin and large stall shower). Awarded 2nd best boat in BVI boat show. 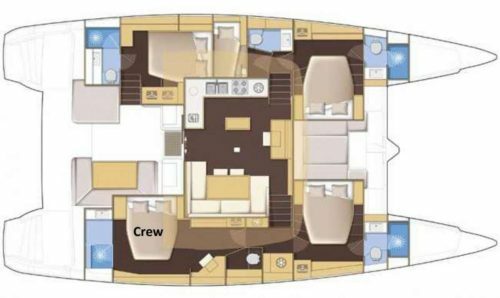 ON SPECIAL REQUEST: yacht can offer 8 guests in 4 queen cabins and crew will move to bunk cabin for added $2,000. BABIES: Babies of all ages welcome. No charge for babies under 12 months if clients bring all supplies or reimburse boat for items purchased specifically for the baby. SLEEP ABOARD OPTION: Sleep aboard the night before charter dates. $250 per person with dinner ashore at client expense. Boarding 4pm or later please. Includes breakfast the next morning. For basic plan, 7 night minimum. For Half-board or full-board plans, 6 night minimum. BASIC OPTION: Includes: 7 breakfast, 7 lunches & 6 one course dinners, only non-alcoholic beverages and includes Yoga, snorkel and SUP use. 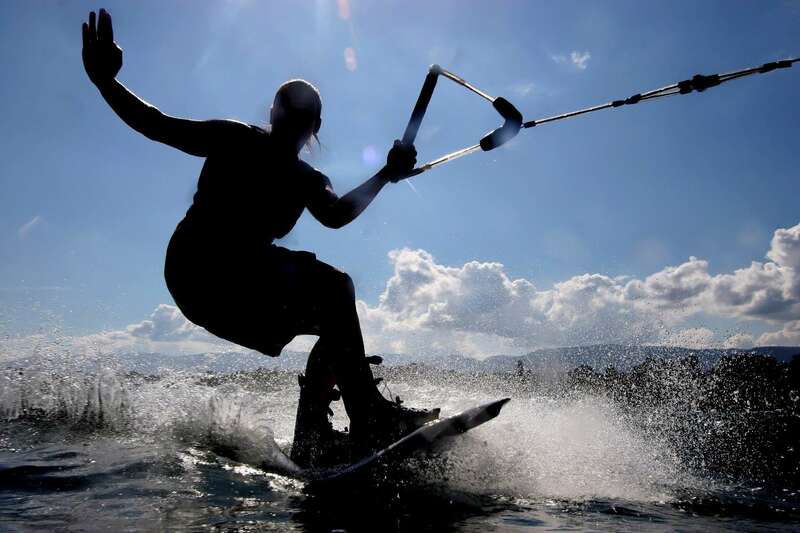 Excludes alcoholic beverages (APA may be paid if some is desired, inquire), watersports of subwing, tube, wakeboard, taxes, permits, internet and marina fees if requested. This is for budget minded families. BASIC HALF BOARD OPTION: Includes: 7 breakfasts, 7 lunches and non-alcoholic beverages (APA may be paid if some is desired, inquire), yoga, snorkel and SUP. Excludes: all dinners, alcoholic beverages, watersports (subwing, tube, wakeboard), all taxes and permits, internet, and marina if desired. NEW YEARS 2019-2020: 1-8 pax @ $30,000, 7 night minimum. New Years must start no earlier than 12/28. Doing what we do best – the perfect crew: always fresh, always relaxed, always motivated! 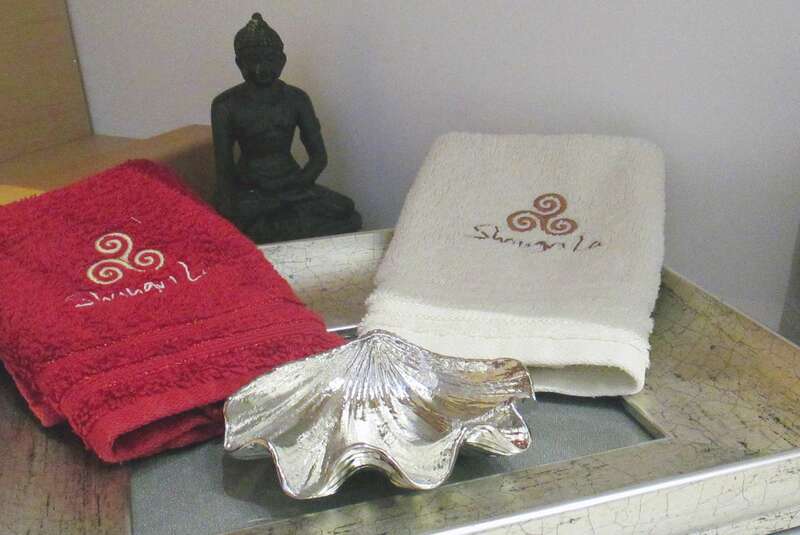 Our Goal on Shangri La is to deliver high end service and quality. That´s what our guests expect and deserve: a vacation of their lifetime! Captain Bernd and Chef Daniela are eager to welcome you aboard for the vacation of a lifetime! This husband and wife team are both originally from Austria, and Daniela’s cooking will definitely tempt you with some fabulous Austrian specialties. Both are originally medical doctors but changed their life for a life on a yacht. Bernd and Daniela are highly experienced and work in the charter business for more than 14 years, they organized sailing events in Croatia for up to 1000 guests. For each guests they love to plan an individual adventure and vacation and they have only one goal in mind: to make this the best vacation you have ever had. No wonder that many of their guests are repeated clients that love and appreciate this professional, enthusiastic and dedicated couple. Bernd (RYA Yachtmaster Ocean) is a dedicated yacht captain and sailor since he turned 18. He sailed extensively in the Mediterranean, Caribbean, US Coast and Bahamas and he sailed Shangri La over the Atlantic. 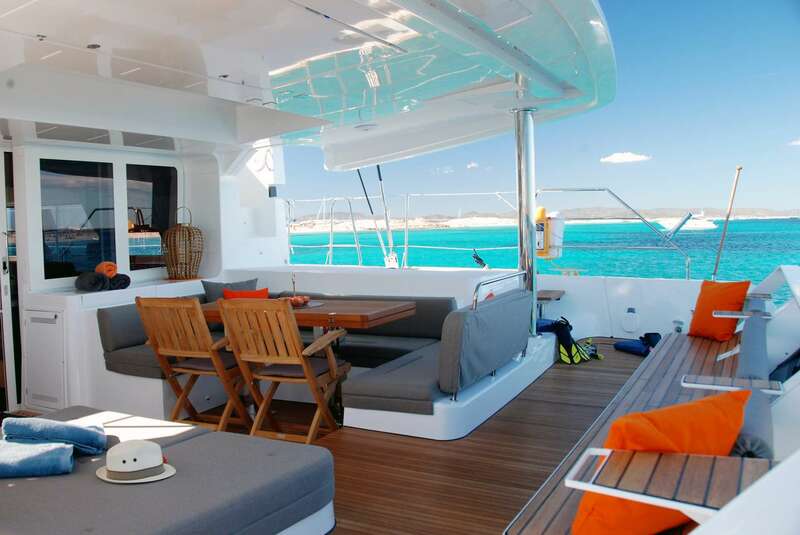 He has a lot of charter experience and optimizes your perfect vacation with lots of local knowledge. He loves to share his passion for sailing, water and nature with all guests as well as his passion of creating tasteful cocktails. On Shangri La´s BBQ he shows his talent in fine grilling. Besides that he is a massive music fan and enthusiastic DJ which, as one might imagine, provides the basis for great on-board parties. This team will turn your sailing vacation to an extraordinary unforgettable lifetime experience! Antonia, originating also from Austria, is passionate about sailing, sports, riding, a snorkel enthusiast and loves to interact with kids of all ages. She studied Tourism and Leisure Industry at the tourism school Bad Gleichenberg, Austria and graduated as a tourism specialist and a sommelier. In the past years during her study Antonia worked at several events for a well-known high class catering company, where she was responsible for guest care. She also managed a B&B in Denmark and she worked as a sailing teacher for kids aged 8-13 years. Antonia fits perfect to the high-service oriented standards that are offered on Shangri La, she is highly professional, polite and known to keep a tight ship with all her tasks being always under control and in order. Antonia speaks English, German, Italian and French. On Shangri La, her responsibilities as a hostess are, taking care of service & cleaning, preparing & serving her best cocktails, recommending the perfect wine from the on board wine selection and providing a helping hand to the chef. Flexible with a lively sense of humor and a kind heart, her aim is to make your stay as seamless and comfortable as possible. Vienna- Ice Coffee with Cookies or Original Austrian Coffee Specialities with Austrian Cakes, biscuits or Apple strudel?? A daily culinary delicacy surprise from the kitchen served on the Foredeck together with our well known Cocktail Specialities?? 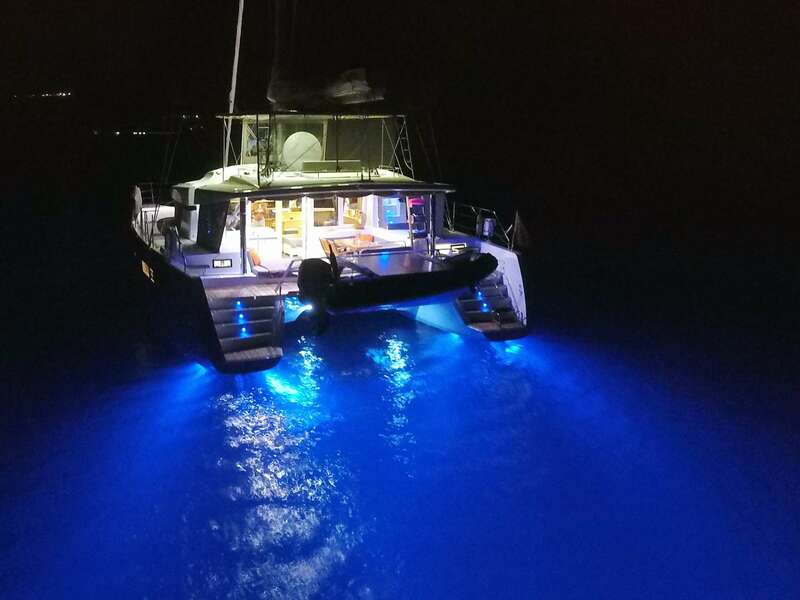 We just returned to Arkansas from our Shangri La charter in the BVI last week, and we wanted to thank you for steering us to that boat and crew. Our experience exceeded our greatest expectations! Shangri La is an impressive sailing vessel. With 10 people aboard (7 in our family and 3 crew), were very comfortable and never felt crowded. Daniela and Bernd were the quenticential hosts whose charm and hospitality were unparalleled. From the initial email communication, to the personal calls a week before the charter, our initial meeting, the sailing experiences, the delectable dining experiences, the options for daily sailing and adventures, to the sad farewell, we all had a exceptional experience. We feel as though Daniela and Bernd are now part of our family! The dining experiences——how does one say superb 5 Star cuisine three times daily for seven days? We ate at several nice restaurants on pre trip St John and post trip St Thomas, but found Daniela’s meals exceeding all of those! Bernd made sure no cup was empty with wonderful new Caribbean concoctions, as well as an good wine selection. The music theme pairings with themes of the meal only added to the cuisine excellence. We additionally were treated with an another host in Morgan, a very smart and personable young lady from Maryland. Morgan was a substitute for their regular assistant who had gone back to Germany. Morgan complemented Daniela and Bernd seamlessly. They all bent over backwards for our 4 and 5 year old grandchildren (of course, as well as us)! If you were to ask Cecile and me to recommend a perfect vacation/holiday, we would answer “spend a week with Bernd and Daniela aboard Shangri La.” We hate to be too effusive in our praise, for fear you will publicize our comments, which will make it more difficult to rebook Shangri La in the future. Your hospitality, generosity and sincerity have been a blessing this week. We´ve appreciated you more than you know. Our DREAM vacation is complete! Everything was a great adventure, which we enjoyed thoroughly. Thank you for the sailing, snorkeling, watersports, gourmet meals, and most importantly YOU! Godspeed and many blessings and well wishes for all your adventures. Thanks for the sailing experience of a lifetime. You didn´t miss a beat when we informed you that we would also through a wedding into our charter plans. (Only 2 weeks notice) Within 24 hours of boarding the Shangri La, Brad and Victoria were married on Trunk Bay. You even managed to successfully tender the wedding cake aboard in the rain and waves. The Shangri La is an exquisite Sailboat. The attention to cleanliness and detail is much appreciated. Thanks for making this a special trip.. we will be back!!! Huge thanks for the past week that we spent sailing around the beautiful islands of the BVI. This was a bucket list trip for me and my family. We made some amazing memories we will have forever. And if we can´t remember we will always have our video. Tony- we appreciated your skills and abilities in sailing and getting us everywhere. And for answering all my questions as we sailed. We loved the sailing portion of the trip – it is magical when the sails are out and the boat flies. Kate – you are an amazing and wonderful chef. Great food! Can´t believe how you just worked and worked and made such tasty and beautifully prepared food. Everyone had their favorites: steak, quesadillas, crepe, the deserts and on and on. The food was a highlight. Lena- you welcomed us back to the boat with a greeting and smile each time. You were very kind and helped extremely to make this a trip of a lifetime. Loved how you recognized the bucket list family music. Thank you for such a wonderful week. The snorkeling was fun, beautiful clear waters. We loved the relaxing sails and the swim-up beach bars. Great to see everything rebuilt so quickly. A wonderful time with our family. Thank you to our fantastic crew: Lena, for keeping us organized, everything running and fantastic yoga to get us started each day. Kate, for preparing so many wonderful meals, we could not pick a favorites. Capt. Tony for always knowing the perfect place to be on the perfect day, with great stories and DJ knowledge. You have deepest thanks for a perfect trip with our family that we will remember always. We were spoiled by Kate’s culinary skills and have some photos as proof. 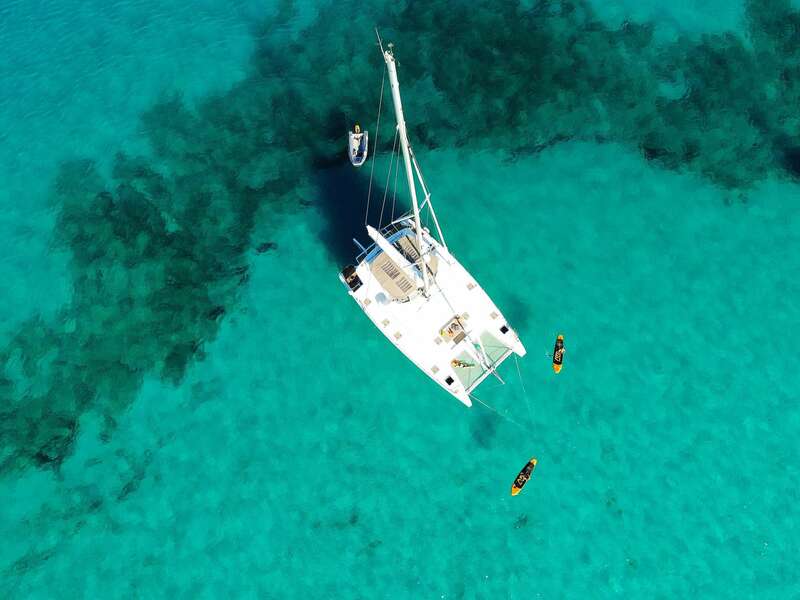 And Captain Tony managed to sail us here and there and everywhere – too many to name – Anegada, the Baths, the Indians among my favorites – and don’t forget the Caves, the jokes, the music playlists, Farkle games, sub-winging, snorkeling, paddle-boarding! Lena’s delightful and her attention to every detail made such a difference. She has such a precious personality – so pleasant! Our thanks to all of you!!! Blessings. Refueled with sun and new impressions unfortunately this beautiful journey is coming to an end. Great food, the perfect crew/hosts, unbeatable sophistication- it is difficult for us to go back home. Thank you very much for this wonderful time and these great experience. February 2018 We love to sail! Do you? We love to sail! Do you? Sailing BVI aboard the LUXURY catamaran Shangri La. Our Captain, Cook and crew were AMAZING!! Such a stress free vacay aboard Shangri La as the crew catered to our every needs—they SPOILED us!! Thank you so much Bernd, Captain, Manager and Perfectionist and Daniela Chef, Master Yoga Instructor and an all arround “LOVELY” person inside and out! Thank you for such a wonderful and enjoyable experience! It surpassed all our expectations of a LUXURY sailing experience! I feel so blessed to have found your vessel. You are the perfect boat & crew. It’s very clear why Shangri La won 2nd best boat at the show—an award you should be very proud of! You and the Captain make a great team ? The Land Of Oz Crew (Kansas is often referred to this from the famous movie The Wizard Of Oz): Dave, Debbie, Tom, Cindy, Margie, Ron, Rich & Nancy ?? PS: We couldn’t wait to see what you were cooking for dinner. It was so fun looking forward to your lovely & delicious meals! We had 12 wonderful days aboard Shangri La in the BVIs. Dani and Lena took care of wonderful culinary highlights each day that we had to “work off” in the morning with yoga. Bernd spoiled us with secluded beaches and coves. It was a fantastic island hopping – with snorkeling, bathing, fun in the water, on board or at the beach. Bernd made every day special. His local knowledge and his sailing skills are enormous. From the first moment on we felt so comfortable. Dani & Bernd are a perfect team that pampers their guests very personal and professional from morning to evening with Kaiserschmarren “all you can eat” accompanied with Viennese Waltz music, or barbecue night, great steaks by Bernd prepared on the Weber Grill with Caribbean sounds under the beautiful starry sky. Yes, here comes everybody the mood for a wild dance party with great music. It has been great fun with you, keep doing this and again a very warm thank you for the wonderful time with you. I wanted to thank you for your help with our BVI trip. We had an incredible time. The catamaran, Shangri La, was perfect. Well-appointed with great rooms and for such a small space, we never felt like we were on top of each other. The crew was fabulous. Bernd (the captain) was always ready with ideas of where to go—we visited the Baths on Virgin Gorda, snorkeled at a few famous and wonderful spots, including the Indians. He set up an impromptu sundowner on a beach one night, made cocktails and set up a limbo game with a tree branch. Super fun.He was always making fun cocktails and the boat had tons of fun activities using the dingy—there was tubing and wake boarding and something called a sub-wing which we’d never heard of. The kids tried it all (as did most of the adults.) Then, during the sails, we rested and read and napped. A perfect combination of down time and activities. The food was also incredible—fresh tuna steaks, rib eye, sashimi, a stuffed pork tenderloin and Daniela (the chef) was great about accommodating the kids’ more limited palates. If you have clients interested in the BVIs (or a catamaran in that region), I would strongly recommend Shangri La. I hope you’ll pass on our thanks to the boat company, too. All in all, it was a perfect trip. Chris ranks it top 2 with Africa and I think I agree. We look forward to going back! La! We had the best time!!! Your hospitality and service were impeccable. Celebration. Dani, you are a much better singer than Bernd! is a phenomenal boat, much to be proud of. We wish you all the best, smooth sailing and a nice breeze at your back. From our Family – Haley, Briana, Nicole and Terence from the Great state of Colorado: The boat was immaculate. The Captain trustworthy, knowledgeable, and with a great sense of humor. Daniela, a marvelous cook! Exquisite! Bernd, a lucky man. Lena, fabulous service always with a smile. This was a trip of a lifetime! We enjoyed learning to wakeboard, playing karaoke and dancing all night. We will never forget this trip and the wonderful crew- see you again! This has been such a fantastic trip – a week of relaxing, sailing, eating, drinking, and being together with my sister and her family. Thank you so much for sharing your fantastic spots with us. We look forward to coming back for another week. You guys are WONDERFUL! There hasn’t been a better week in my life that I can remember. Certainly for me, the Caribbean and the Virgin Islands are amazing, but the crew of Shangri La were incredible, and this trip has been a beautiful moment in time for me. I am forever in your debt. Thank you Bernd, Dani and Lena for that wonderful trip. We enjoyed each minute but especially the yoga in the morning, our card games at night, wakeboarding and subwinging, the Scooter-Tour in Anegada, all the white beaches and lonely bays, the snorkeling, the Austrian Glühwein and “All you can eat – Kaiserschmarrn”, the best Gin&Tonics and Painkillers, the fabulous and amazing food and last but not least our X-mas karaoke. Thank you for everything! We really loved to sail with you! Thank you so much for the wonderful time on Shangri La. It was another great trip- especially Anegada. Thank you for taking care of little David and thank you for the superb food- it deserves *****. This was our second time on Shangri La and we are sure that we´ll come back.. see you next time! A fantastic sailing trip- thank you for everything! We sailed with Shangri La now the third time and each time it is just phenomenal – a lot of champagne, yoga in the morning and Zumba in the afternoon, Laura´s birthday party, awesome food (we loved the Kaiserschmarrn), best cocktails and unforgettable sailing! Thank you – Shangri La rocks!!! Ha ha! Great picture. Thanks again for everything. You are both good people. We appreciate all you have done to make our much needed holiday very special and memorable. We had a great time and feel we made two new friends. Thank you so much for making this vacation so wonderful! You made the trip so much fun! I loved all the water sports and meals and yoga in the morning! If we ever go skiing in Austria we’ll give you a call. The food was AMAZING!!! That was the best wiener-schnitzel that I’ve ever had! I also LOVED the (virgin) cocktails and I loved you guys! Also thanks for teaching us some German, I can now successfully call someone a liar in German. The karaoke was really fun! We decided to try something new in the BVI and chartered Shangri La for a week. Our party was three adults and one four year old. From the minute we joined Shangri La to the time we said farewll we had an excellent time. Dani’s meals were excellent and she provided a great variety of food each day – the only problem was it was more food than we could eat. Dani’s morning yoga was a hit with us all including the four year old. Before we went on the trip we were very uncertain about comfort and safety while on board, and I am happy to say that the boat is comfortable in every way and the crew make you feel safe at all times. We enjoyed Bernd’s cocktails and several really good wines and champagne were available throughout our stay. Overall this was one of the most fun and adventurous vacations we have taken and would highly recommend that others join them as well, as it is all first class all the way! A boat full of doctors.. Safest trip ever! Thank you graciously for the most wonderful trip. The four of us enjoyed every moment of our journey. The care, concern and hospitality was evident the moment we first step foot on Shangri La. The food, the drinks and the love you shared with us will always be remembered. Our son, Liam, was as comfortable at sea with you guys as he is at our home. This was a once in life time experience! For everyone else…..this is a must on your bucket list!!!! If the winds of the world ever find you in Houston we look forward to returning the love! We have talked about going on a trip like this for years.. and wow what an experience! We loved EVERYTHING. Thank you both for an amazing, relaxing, physically challenging week. It was filled with many memorable activities that kids and parents loved, exquisite meals and great naps while sailing in spectacular waters and secluded beaches. 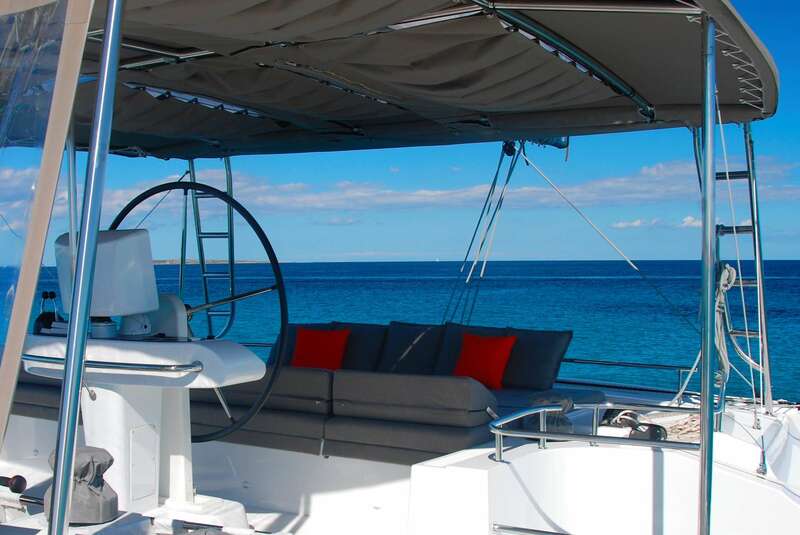 Not to mention a beautiful and impeccably maintained luxury filled catamaran. The food was so amazing, Danny you are an awesome cook! We appreciate the patience you had with our kids, they loved you and had so much fun. We still haven’t been able to get back to reality…..breathe iiin…..breathe ouuut..(yoga each morning) Thank you again for everything, we will definitely do that again! Thank you so much for an incredible time! For anyone considering a Shangri La vacation, I’d tell you that the yacht is spacious, impeccably maintained and luxurious, and the food is excellent, but best part of a Shangri La vacation is that the captain and crew have only one goal, to make this the best vacation you’ve ever had. We spent a week on Shangri La in June of 2017 and couldn’t have been happier. Every day was a new adventure planned just for us. 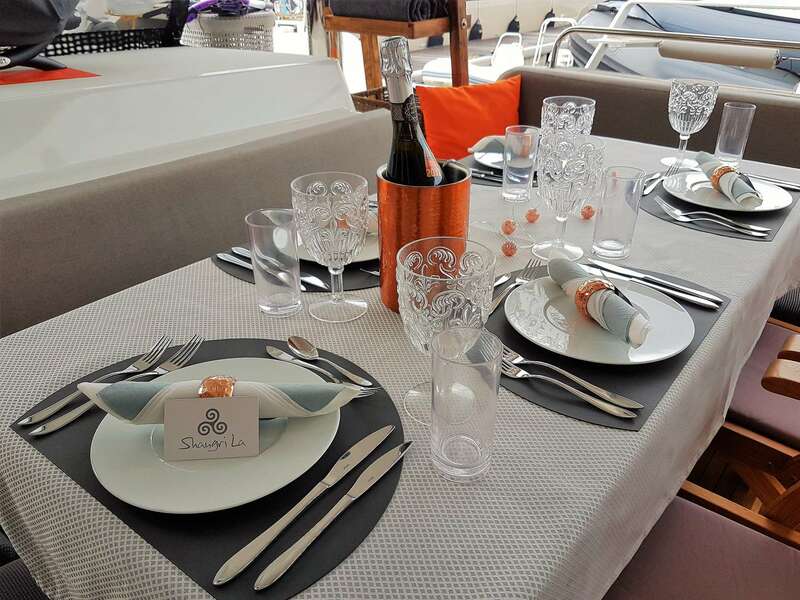 We could request a location or take the advice of Daniela and Bernard and enjoy the surprise. We went to remote beaches and had bonfire picnics, were led on snorkeling expeditions at some of the quieter locations and in general treated like royalty. This was the 5th time my wife and I had been to the BVIs and it was by far the best trip we’ve ever had. We had 3 generations on board and from the oldest to the youngest everyone agreed that it was our best vacation ever. Thanks so much. Looking forward to our next trip. What a wonderful trip! Thank you so much for this great adventure! The food was wonderful – a five star experience! Can´t wait to come back for Bernd´s Shangri Lada Cocktail. Couldn´t have asked for a better crew! We loved the time here. What an amazing, beautiful trip! Our family had the most wonderful vacation. Truly a vacation of a lifetime. I don’t even know where to start and what was my favorite. The Islands were spectacular, subwinging was a blast and proud of myself for conquering my fears of the ocean. The food and drinks were always outstanding… I could go on and wish we could have stayed longer. 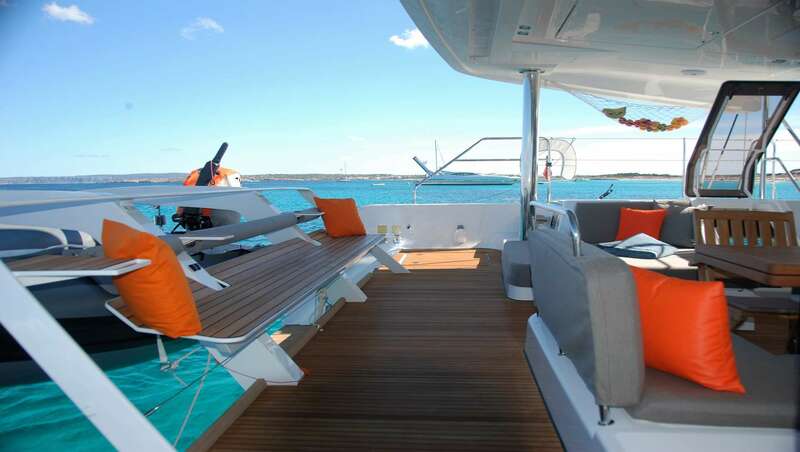 This boat is absolutely beautiful, super clean and had everything you need to just relax. Thank you for the great hospitality and grace with 5!!! Kids! Thank you for the best vacation ever on Shangri La! We stayed on Shangri La the third time now and every time it is just amazing! And we are coming again!!!! Thank you for that awesome trip, for paddle boarding, karaoke, Willy T, snorkeling with turtles and tarpons, yoga, the swimming bar, all the amazing food and the unforgettable beach party with BBQ! Bernd and Dani are just amazing! Thank you for that unforgettable honeymoon. We enjoyed the days on Shangri La! Dani and Bernd are perfect hosts and we will never forget the yummy food and the relaxation, that can only be found on their boat. Thank you for taking that great care of us this week and your generosity and hospitality. As our first vacation on a boat Bernd and Dani have given us amazing memories we will always cherish. Dani’s food is superb and Bernd´s cocktails are tasty and fun! Additionally we appreciate very much their kindness and care for our little son making him feel welcome and happy. What can we say, we have now chartered with this crew twice in less than 5 months and we will be joining them again in 5 more. The Shangri La is first class in every way! With the brand new bigger boat and new toys, there is endless fun to be had! Norm can not wait to Sub-Wing again! Safe travels across the Atlantic! Can not wait to our next adventure! Lindy What can we say, we have now chartered with this crew twice in less than 5 months and we will be joining them again in 5 more. The Shangri La is first class in every way! With the brand new bigger boat and new toys, there is endless fun to be had! Norm can not wait to Sub-Wing again! Safe travels across the Atlantic! Can not wait to our next adventure! May 4-9, 2016 Bahamas Honeymoon! This was undoubtedly the best cruise we have had in eight years. Daniela and Bernd took care of our every need, with great food and copious refreshments and could not have been more attentive. In addition they are lovely people, fun loving and there was much fun and laughter on board Shangri La every day. We sailed to many lovely islands with stunning beaches, many of them uninhabited so that we had the beach, island, and sea to ourselves. On one deserted island Bernd and Daniela arranged a beach barbque using drift wood for the fire and we watched the sun set while Bernd cooked great steaks above the glowing fire embers to the sound of music provided by a large music center, brought ashore for our entertainment by our hosts. We enjoyed our food as it got dark on a beautiful warm night with nothing above us but the stars and the waxing half moon. We took care to return the beach to its original pristine condition, before we retired on board Shangri La for a good nights sleep at one of the many safe and tranquil anchorages that Bernd knows so well. All in all a very pleasant and memorable holiday.